It seems like nobody can describe Italy without mentioning its quaint cobblestone streets, exaggerated hand gestures, glorious ruins and even more glorious food. But the fact is, Italy’s magic really does pervade those fabled streets. Or maybe that’s just the breeze as a Vespa whizzes by. In any case, there’s something indescribable about this country and its layers of history meeting modernity that can’t be missed on an indie trip. The sights. There’s nothing quite like wandering the ruins of Pompeii, sipping a cappuccino in Piazza San Marco, or gazing through the oculus of the Pantheon. And did you know that Italy is home to the most UNESCO heritage sites in the whole world? That’s a whole lotta history and culture to check out! The Food. Yes, Italian food deserves that capital ‘f.’ Italy is more than just fresh pasta and gelato and pizza; it’s also truffles and sea food, some of the best olive oil you’ve ever tasted and so much more. Each region of Italy has its own flavor, and discovering these is one of the best treats of traveling the boot! The pace. Il dolce far niente literally means, “the sweetness of doing nothing,” and few cultures have perfected this as well as the Italians. Take a few extra minutes—or hours, or days—to let yourself soak in the sights, the sounds, the smells. Relax. Especially at the dinner table. The possibilities! Italy’s diverse terrain and climate provide options for travelers with all kinds of interests. You can bum around on the beaches of Sardinia, hike the Cinque Terre or cycle the hills of Tuscany! Skiing and snowboarding opportunities abound in the north, and for the truly adventurous, there are always outlets for the other sport: shopping. Rome is definitely a must-see , especially for the first-time travelers to Italy. The Roman Forum and the Coliseum are just two of the highlights. Shopping. Or at least window shopping if your budget doesn’t allow for more. Tip: the markets are excellent options for food, souvenirs and more. The Adriatic coast is a nice option for a beach destination. But it does get very crowded in the height of summer. Read: Italy's Hidden Treasures: Indie Exploration in the Alps. Branch out into other regions. Instead of Tuscany, try Umbria. Venture to the Adriatic coast rather than the Mediterranean. You’ll find that many of these overlooked areas offer just as much to do and see, but with fewer tourists. Along those lines, do daytrips to break up the big cities with smaller towns! From Rome, go to Orvieto; from Milan, go to Pavia; from Florence, go to Arezzo. You’ll get a different perspective on the country and it’ll be an even better glimpse into the varying regional cultures. Regional train tickets won’t break the bank, either. For those interested in volunteering, Italy has many opportunities. In fact, it has one of the most extensive networks of farms for WWOOFing; you can help with the olive harvest, learn how grapes go from the vine to wine, and so much more. A sure-fire way to get a good glimpse into daily Italian life is to go to the markets; every city and town has at least one although days vary depending on your location. Wander through the rows of stalls and pick up some fruit, meat, cheese, or bread for lunch—the cheapest delicious meal you could get! Plus, it’s not just food that they sell there. Pick up luggage, clothes, home goods and more! There isn’t really such thing as an ‘off-season’ in Italy, particularly in Rome and Florence; but try traveling in the fall, which is one of the most beautiful times of year, or late spring to get better prices and experience cities & towns with fewer tourists. Use that UNESCO list! Hit up some of the lesser trafficked gems of Italy, like Tarquinia or Paestum. Design your own food tour. Pick a few favorite foods and visit the region that specializes in it. Nothing quite beats tasting Pizza Margherita in Naples, or savoring Chianti in its Tuscan home. And if you’re in Perugia in October, they host the biggest festival devoted to chocolate. Yum! Hike the trails in Cinque Terre. While the area is very popular among tourists, not everyone choose to hike the trails. So, walking shoes, water, map and camera…and you are set. If in Venice, explore the archipelago. The further from Venice you go, the less touristy it gets. On the small islands, put on your walking shoes and explore at your own pace. Herculaneum is not as popular as Pompeii in terms of visitors but it’s definitely an excellent place to visit. It’s accessible via Naples. The city was much smaller than Pompeii but the ruins are better preserved. There are still parts of Tuscany which are not on the tourist trail. So rent a car and stay away from the rail line. You’ll have a blast. Read: Italy Made Easy: 5 Stress-Free Travel Tips. Head on over to our Italy Travel Guide for lots of good info about visiting Italy. Viva Italia! Italy is nearly every traveler's dream - it has been on everyone's travel itinerary for centuries, and with good reason. Renaissance masterpieces? Check. Medieval towns? Check. Ancient festivals? Check. Fantastic food? Amazing wines? Fashion trendsetters? Fast cars? Beautiful scenery? Chaotic (and addictive) cities? Check, check, check. Yes, Italy has it all. It is almost impossible to travel in Italy without finding something historic - Italy has the most UNESCO World Heritage Sites on the planet, and there are plenty of things that UNESCO doesn't bother listing that are probably older than anything you've seen before. This is a country with history. Rome is the epicenter of what was once an immense empire 2000 years ago, and you can still walk the cobbled streets that Caeser once walked in the Roman Forum. Now that's cool. And speaking of history, you can also visit Vatican City within Rome's city limits and experience the history of the Roman Catholic church in all its larger-than-life color. But Italy doesn't end with Rome - not by a long shot. Most visitors to Italy go for the “holy trinity” of cities - Rome, Florence and Venice - and it's not surprising why. As the birthplace of the Renaissance, it's got so many masterpieces in its galleries and museums that you'll need to spend weeks there to really see it all. Florence's hometown heroes of Michelangelo and Leonardo da Vinci certainly left their mark on the city, and its historic center remains a beautiful (if sometimes chaotic) place to explore. Venice, on the other hand, is usually the furthest thing from chaotic. This fairy tale of a city is like a theme park for adults, and you'll never see anything like it anywhere else. It's impossible to get lost (you're on an island, after all), so the best possible thing you can do is wander aimlessly. Certain areas might seem overly busy, but if you get further from the tourists, you'll see where the real Venetians still live. If you're looking for more than the “holy trinity,” there's a lot of land between and around them. Siena is a popular stop for travelers in love with Tuscany, partly for its Medieval charm and partly for its annual Palio horseraces. The five tiny villages of the Cinque Terre might not be the undiscovered gems they once were, but they're still beautiful and the hike between them is still a lovely way to spend a day. Milan is more of a fashion and finance capital than tourist capital, but it still has its share of reasons to visit - including Leonardo's "Last Supper" and some of the best window-shopping on earth. The leaning tower of Pisa might not be the only leaning tower in Italy, but it's certainly the most popular, and it makes a decent day trip. Naples is where pizza was born, and this gritty Italian city will give you an idea of what the real Italy is like - none of that polished nonsense. 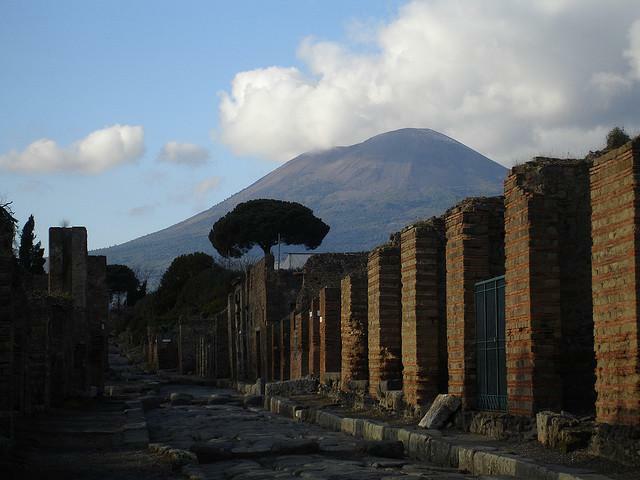 It's also a great base for exploring the preserved ruins of Pompeii. And then there's the south - largely undiscovered by tourists, this could be the final frontier as far as Italy's concerned. No doubt it won't stay that way, of course. Wherever you plan to spend your Italian holidays, if you do your homework before you go you'll find excellent food, see amazing art, soak up some history and see some of the liveliest people you'll ever meet. Read: 6 Ways to Make Your Italian Vacation More Interesting. Getting to Italy is easy - just search for airfare to Italy and you're on your way. The biggest entry points for foreign travelers to Italy are Rome's Fiumicino Airport and Milan's Malpensa Airport, but if you're flying from Europe there are smaller airports all over the country which are easier to navigate. Also, for some largely unknown reason it's usually more costly to fly into Italy than into other European countries, so if you can find a good deal on a round-trip flight into Paris or London, for instance, and then take a short flight to Italy - you might save yourself some money. Read: Eat Your Way Through Italy: 4 Stops on an Italian Foodie Tour. Italy has the usual accommodation varieties, although you won't find as many properties calling themselves "hostels" here as elsewhere. They might be called one-star hotels or even guest houses or B&Bs instead. Be advised that since so many people visit the country every year, booking your Italy hotel or Italy hostel in advance is a very good idea. If you want to read more about traveling to Italy before you're actually there experiencing it for yourself, you can enjoy our Italy travel stories. And be sure to check out our Italy Travel Guide, which is updated regularly and includes all kinds of travel tips and information about this beautiful country. Oh, and it's pretty much a rule that you must have at least two scoops of gelato every day. Don't let anyone try to tell you differently.